What Would It Take to Make You LOVE Mondays? Find Out Now! How often do we hear comments and phrases referring to Mondays? Most often, they’re not very positive or uplifting comments either. 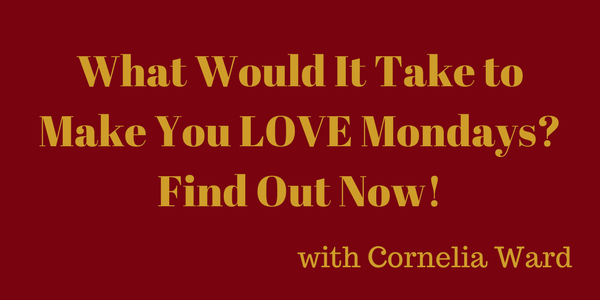 Well, my guest today, Cornelia Ward, has figured out the trick to help people LOVE their Mondays! While dealing with her own personal career transition, she really stopped and thought about how crazy it was for somebody to drag themselves everyday to a job that makes them MISERABLE. She created a six-step program called Passion and Purpose: 6 Steps to Create a Career You Love. Tune in today to get the inside scoop on these six simple steps and enjoy many other freebies too! ALSO AVAILABLE ON ITUNES!